With Christmas only a few weeks away we have started to think of the best places to spend Christmas and New Year and have compiled a list of our top five favourite Christmas locations. 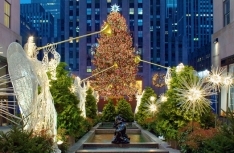 New York has a magical atmosphere around Christmas and you will have seen many Christmas movies set around New York City, to wet your appetite about spending a Christmas here. As you would expect there are so many things to see and do in New York from looking at the lights in Radio City, to skating outside the Rockerfella Centre to signing carols in Times Square. For shopaholics there is no better city to shop in the snow and a visit to Macy’s Santaland is a must as it will make a Christmas here all the more spectacular. Why not swap Christmas turkey this year with roasted lobster by visiting Boston? Boston has such an old-world charm and ambience it will give you a cosy Christmas feeling that will be hard to find anywhere else in the world. The different types of accommodation that can be found in Boston only add to its charm with many classical hotels with antique fireplaces offering you the ideal location to escape from the snow. That combined with the great dining experiences available all contributes to the perfect Christmas retreat recipe. For a totally different Christmas experience to one in England then you must head to New Zealand’s subtropical beaches. Instead of sipping eggnog around the fire you will be drinking a cool lager lying on a picturesque beach with the sea tempting you to take a dip. This is the ideal Christmas break for those looking for a serene seaside setting where you can relax as well as taking in some of the local sports such as deep sea fishing and sampling the local cocktails and the local catch of the day. Paris is known as a romantic city and at Christmas there is even more of an enchanting spell cast upon the city. The city at this time of year is decorated in tinsel, lights and nativity scenes which makes the landmarks such as the Eiffel Tower, Champs Elysees and Notre Dame even more spectacular to the eye. And with the abundance of advent markets around the city it makes for a memorable break. For those of you who are a kid at heart then head for Disneyland Paris and enjoy the funfair rides, restaurants and ice-skating all in a magical wintery setting. You shouldn’t overlook Edinburgh as one of the best places to spend Christmas. This close to home destination is guaranteed to be covered in snow and with its German markets offering traditional wooden toys and German foods and beer; it is a great place to get into the Christmas spirit. Edinburgh also is home to Hogmanay which is one of the biggest New Year street parties in the world where you can celebrate the passing of another year in true Scottish style.